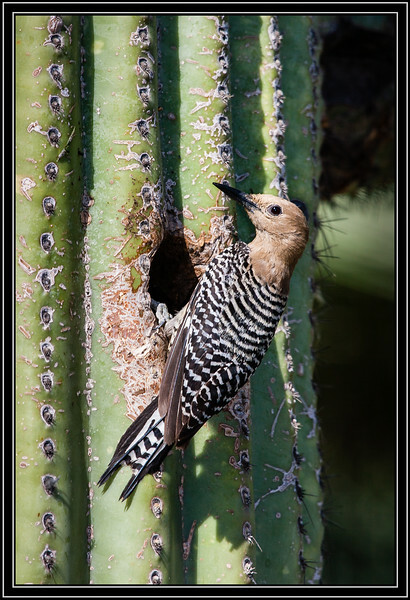 Gila Woodpecker - Shot at Glendale, AZ Botanical Garden. Very nice capture of this Gila Woodpecker. This is absolutely awesome! Love it! Very beautiful woodpecker !! I had no idea that they could possibly use a cactus as their nesting tree. Love the head angle !! Great to see the woodpecker by the nest hole. The Gila is a very noisy one, making their presence known. Amazing to me that birds can nest in giant cacti like this (saguaro, I suppose). Wonderful capture of this one.